Fact-Checking Drake: Does Toronto Really Love Him? : The Record We ask a professional to find out if his hometown supports the rapper as much as he says it does. Fact-Checking Drake: Does Toronto Really Love Him? 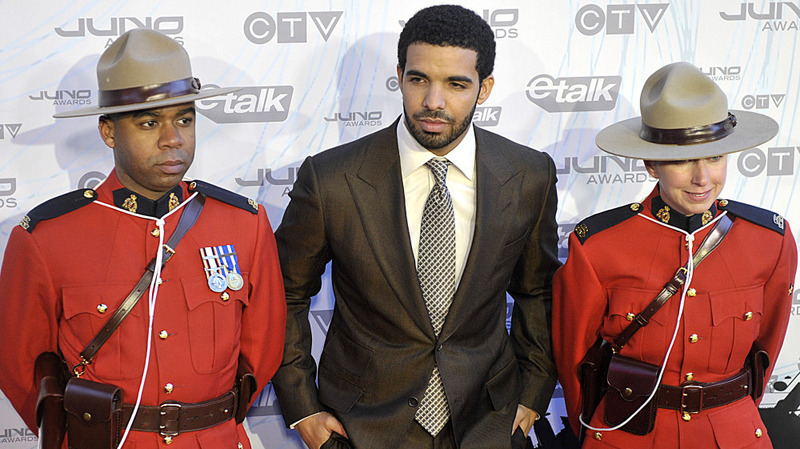 Drake poses on the red carpet at the 2011 Juno Awards (Canada's Grammys) in Toronto, flanked by two members of the Royal Canadian Mounted Police. The rapper Drake has, if you go by one of his song's lyrics, a short list of interests. The first is money. The second is the city of Toronto. In the world of hip-hop, it's not outlandish to identify the acquisition of wealth as a motivator, nor is it particularly odd to claim mythical status in one's hometown. At the ripe old age of 25, Drake estimates his worth to be about $25 million. But "I run Toronto"? That part is different. In "City Is Mine," from his first mixtape, Room for Improvement: "Yo the city is mine. Which one? T-O-R-O-N-T-O." In an interview with Stereogum: "Everywhere I go, I'm like, 'I'm from Toronto.' They respect that and love that so much." Obviously, somebody loves Drake. Take Care, his second studio album, currently tops Billboard's Rap Albums chart, and is second for all genres. It was the seventh biggest-selling album of 2011. But does Toronto love him? Or is this just another example of a superstar rapper's exquisite self-regard? The easiest way to fact-check a Whitmanesque claim like "I am Toronto," was to call Dave Bakula, a senior vice-president for entertainment analytics at Nielsen Entertainment, and find out how Drake's sales in Toronto compare to those in other cities. But first, to fill in the picture, I called people and organizations likely to know and understand different aspects of the "schismatic" city. "Back in the day he wasn't getting that much love," said Rich Kidd, a Toronto producer and MC. From 2001 to 2009, Drake was a star on the Canadian TV teen drama, Degrassi: The Next Generation. (The show aired on a channel owned by Nickelodeon in the U.S.) Players in the Toronto music scene were skeptical about his transition from angsty child actor to rapper. Drake released the track "City Is Mine" in 2006. Jonathon Brown, an editor for Hip Hop Canada in Toronto, said it wasn't, quite: "Although he was tolerated, he didn't really have the cred yet to say 'The city is mine,'" Brown said. But he suggests the track may have started to convince the city of the statement's potential truth, however. "They played that all over." Still, Canadian labels shunned him. "They thought that, just like any other Toronto rapper, he wasn't going nowhere," Kidd said. "Labels kinda gave up on hip-hop in Canada." So Drake took his talents south. In 2008, he went to Houston, where Lil Wayne took him under his wing and out on tour. BET and MTV showcased his work. In 2009, two singles from his third mixtape, So Far Gone, made Billboard's Top 10. In June of that year, after a bidding war between U.S. labels, he signed with Lil Wayne's Young Money Entertainment (owned by Universal Music Group), in Miami. His first studio album, Thank Me Later, went platinum in the U.S. in 2010. By then, Toronto was on the bandwagon. Dave Bakula ran the numbers for me. Take Care was released on November 15. It has already sold over a million albums: more than a million in the United States, and more than 100,000 in Canada. Roughly 40,000 of those sales have been in Toronto. 40,000 may not sound overwhelming, but you have to break it down. Toronto is Drake's sixth-biggest market — after New York, Los Angeles, Chicago, Houston and Philadelphia. Bakula pulled the Toronto sales of four other rappers — Lil Wayne, Jay-Z, Kanye West, Eminem — from their combined North American sales. "For a major release, we'd expect Toronto to be about 1.5% of the total," he said. Sales for Jay-Z, Kanye West and Eminem met that mark. The weak link, Lil Wayne, sold only about .5% of his albums total in Toronto. Drake's sales in Toronto doubled the average, hitting 3%. Within Canada, Toronto's share of Drake's sales was roughly 40%. For the same type of major releases, Toronto is usually 15%-20% of total Canada — Lil Wayne's sales in Toronto were 14%. Of course, it's not just whether Drake sells a lot of albums. "The overall vibe in the city is behind him," said Gavin Sheppard, the co-founder and executive director of the Remix Project, an incubator for Toronto youth in the arts. The Maple Leafs, Toronto's professional hockey team, listen to Drake during their practices. According to a statement he sent me, Mayor Rob Ford has him on his playlist. He calls Drake an "amazing artist." The leading local urban commercial radio station, FLOW 93.5, plays Drake songs more frequently than just about any other artist. And Drake returns the love. In 2010, he staged a summer music festival, the OVO Festival, and he did it again in 2011. (OVO stands for October's Very Own, Drake's entertainment company.) The festival shuts down the city, with major acts like Stevie Wonder, Jay-Z, Eminem and Nas, plus homegrown talent like Kardinal Offishall and Drake's friend and R&B wonder boy, Abel Tesfaye, better known by his stage name, The Weeknd. "He's bringing things that would never have been possible before for Toronto," Sheppard said. "He made it happen and he's sharing that moment with us. People here respect what he's done for the city in terms of opening doors. He brought the spotlight to this city." To promote his new album, Drake appropriated Toronto's official city logo for a billboard placed over the expressway that leads downtown. He didn't ask permission, and after the city reviewed the matter, it decided to let the billboard remain. The billboard has the name of the album and its release date under the Toronto logo and above the city's population: 2,753,609. Sheppard said he works every day with 16- to 22-year-olds from poor neighborhoods, and they all like Drake. "These kids feel him, they support him," he said. "Some people say he ain't got the ghetto — he doesn't know what the ghetto feels. Well, he does. We're out there." Drake grew up in a wealthy Toronto suburb called Forest Hill. (As Brown put it, "He's not out of the hood, so there are not a lot of hood tales that would have planted the seed for any bad blood.") Sheppard thinks that Drake embodies the state of in-between-ness that is constantly being navigated in Toronto — what he calls "a schismatic and at the same time cohesive city." Many Toronto residents are first-generation immigrants. "Drake intiutively understands that, being of mixed race." He also broke with the more hard-core rap that previously dominated the Toronto scene. "He brings a different edge to it," Rich Kidd says. "He brings a lot of honesty to his music, brings you into his emotions. We all respect Drake — you have to respect his artistry because he's done it in a way that no one else has up here." So Drake's claims check out. Daniel Dale, a reporter for The Toronto Star, told me, "People are proud that he has made it so big and he hasn't forgotten where he comes from." But how does Drake rank in the pantheon of the city's heroes? Does his shadow loom as large as that of, say, Joe Carter, the Blue Jays player who got the final out of the 1992 World Series (Toronto's first MLB championship) and then won the following year's Series with a three-run homer? "There's an age divide," said Dale. "If you're 20 or under, you wouldn't know who Joe Carter was."